18-Apr-2009 -- As we were in the area for an Iowa GIS-GPS workshop, a confluence visit seemed like the perfect capstone to several days of teaching and learning with geotechnologies. Plus, as one of our admonitions at the workshop was to get out into the field to learn about the landscape, we were bound and determined to do just that. And so, after the participants in the workshop departed on the last day of the workshop, we, together with the others on the teaching team, removed data and software from the laptops we were using. We had 30 computers in the lab for the 30 participants, so this took awhile, and we were rapidly running out of daylight. However, we had several folks helping with this operation, and for tidying up the room after two intense days. So, just after 6:00pm, Barb and I left the workshop site in Ottumwa. And, fortunately, it was spring, only 2 months before the solstice; the sun was staying out quite late these days. After stopping to change into different clothes, because we thought we might get muddy after the day's rains, we met at the vehicle and departed the workshop and hotel grounds. It was nearly 6:30pm, but we made good time through Ottumwa on US 63 Business Route and out onto US Highway 34 heading west. The time passed quickly as we talked about All Things Life and Geospatial Education. We journeyed west, toward the sun, while the weather noticeably improved. We remarked how different the land use was in this part of Wapello County than the land north of the Des Moines River. Here, it was noticeably hillier. The sun was layering through a variety of cloud types and we looked forward to what we hoped would be an excellent sunset, preferably after we had returned to the vehicle. In other words, we didn't want to be stumbling around in the dark, logging an incomplete night visit. At last, we passed Georgetown, a magnificent church towering over the few houses that remained, and entered the long curve of US 34. Nearly to the end of the curve, we made a U-turn at the gully, which led more or less directly to the confluence but was filled with fences, steep cliffs, and broken trees. Instead of hiking down the gully, we opted to drive back northeast along the road to the gate that we had seen a few minutes before. We parked at the gate, quickly gathered supplies, and set off. We clambered through the gate. This was a bit tricky as the gate was a metal bar-type, about 3 feet off the ground in a horizontal position, requiring us to step gingerly through it without twisting an ankle. Once successfully passed through, we beheld a wondrous sight: A narrow lane was emblazoned through the grassy field, heading south-southeast, straight for the confluence! The lane was a bit muddy but we made good time, and then hugged the fence and headed due south. According to the "go to" function on the GPS, we knew we would have to cross it at some point. We kept hiking until the fence ended in a "T" with another fence. Here, Barb, being from Wisconsin, decided to chat with the cows we could see in the distance, and I went on ahead. The terrain became quite hilly, but was pastureland and free of thorns and trees, and I quickly lost Barb over the horizon. I continued to the far end of the field and another fence, and then proceeded down the valley that I recognized from the photographs as the one that would contain the confluence. I quickly hiked down slope and found the confluence on the hillside with a slope of 20 degrees to the south. The confluence is not ESE of Melrose as listed in the description, but ENE of Melrose. The temperature was a very pleasant 72 degrees F under a magnificent sky. The sky was more spectacular than the ground, which was still largely brown, just before greening up for spring. The trees in the gully had not yet leafed out, and the longest vista was toward the east-southeast. The north vista was the shortest, up the slope that I had descended. 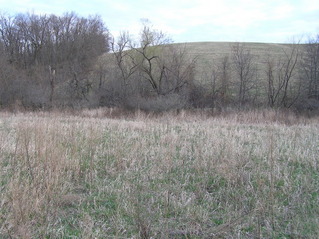 The confluence site was on a grazed field of grass. This was my third confluence in Iowa. I had been to 93 West twice before--in Iowa and Minnesota, but had stood on 41 North many many times, from Utah on the west to New Jersey on the east. I thought about the Native Americans, the homesteaders, and the wagon trains that had passed through here; the dreams fulfilled and disappointed. I hated to depart with the sunset so wonderful, but I told myself that I could look at it while I hiked back. I made as much haste as I could, although the ground was hummocky. I rounded the bends and hills and took a wonderful photograph of the cows against the skyline. Then a moment later, I beheld an incredible sight: There was Barb talking to a whole herd of cows. They seemed quite enraptured by what she was saying, which I couldn't hear due to the distance. I slowly approached; unfortunately, the cows, one by one, scattered. A few calves were with them but fortunately no mean-tempered bulls. I took a few photographs of this amazing sight and have looked at them many times since. I rejoined Barb and we had a good laugh. We took a few photographs of ourselves, but none of them turned out very well. We hiked due north along the fence line, back to the trail, and then out through the wheat field to the gate. Again we were successful at giant-stepping through it and arrived back at the vehicle perhaps an hour after leaving it. We drove back to Ottumwa and stopped at the Hi-Vee grocery store for dinner, and then worked a bit more before saying farewell to each other, to Iowa, and to the GIS-GPS institute. The confluence visit was indeed a perfect way to end the time there. I hope that the friendships we formed with our new colleagues will last and that these educators will find ways of integrating GIS and GPS into their K-12 and after-school programs. 'Tis true what Professor Hill said, "You really ought to give Iowa a try." #1: The confluence of 41 North 93 West, in the foreground, looking due south. #2: Joseph Kerski in an Iowa field at 41 North 93 West. #3: GPS reading at the confluence site. #4: Groundcover at the confluence site--a grazed field. #5: View to the northeast from the confluence. #6: Beautiful sky in this view to the southeast from the confluence. #7: View to the north from the confluence. #8: Wonderful sunset in this view to the west from the confluence. #9: My favorite confluence photo, taken 450 m north of the confluence, looking west. #10: 360-degree panoramic movie with sound (MPG format) filmed at the confluence site.